>>Click here to download the eBook. The most common and fundamental questions that come up whenever I talk about content curation (especially in the context of content marketing) is, “How can you use other people’s content? How does that work with copyright, fair use, and more generally ethics?” This is a topic that I have covered before in earlier blog posts, but since it’s central to curation, it is worth revisiting once again. The publisher – the individual, publication or other entity who has created original content. The publisher is usually interested in increased traffic to their site, boosting their search engine ranking, educating their audience, and possibly monetizing their traffic through advertising or subscription revenue. The curator – The curator is the person or organization who wants to curate the content of the publisher and promote to their audience. The interests of the curator are similar to the publisher but are using curation as part of their marketing strategy. They also want to grow their traffic, search engine rankings, and want to educate their audience. The audience – Lastly, we have the audience who wants to consume the best and most relevant content in a convenient manner. To the audience, it doesn’t matter if the content comes from the publisher or curator, as long as it is both convenient and useful to them. Fair-use and curation of other people’s content becomes an issue when it’s not handled properly because the interest of the curator and the publisher overlap significantly. They both want a piece of the same pie: site traffic, increased SEO and visitor retention. When the curation is done wrong, the curator’s interests are served but the publisher sees no benefit. But if it’s done properly, in a symbiotic manner that makes it a win-win, curation can serve the interest of the publisher, and curator, and ultimately the audience. The key pieces here are that you are not hurting the original author by sharing their work, you are not sharing too much of their work, and that simply acknowledging them as a source may not be sufficient. 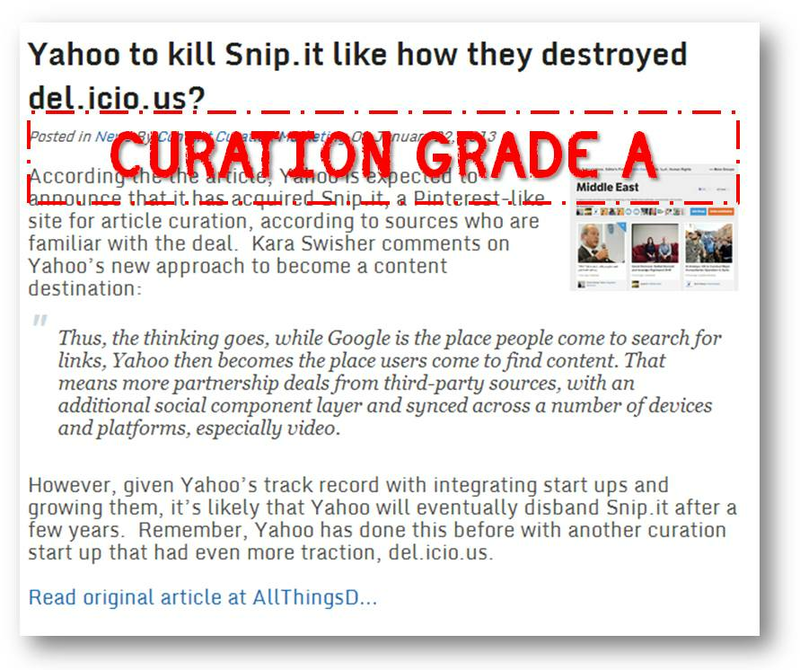 In the next section we go over several examples of curation done right, and more importantly, curation done poorly. The Huffington Post, which has gotten a lot of heat (and mockery) for their curation practices, is our first example. Previously the Huffington Post was known for finding a single third-party article, extensively rewriting/paraphrasing the article, and placing a tiny link to the original source at the very end of their rewrite. They have improved significantly since then in writing articles by stitching together facts and opinions from several different articles, and linking to the articles inline in context, as opposed to at the end of the article. In addition, they are doing several other things right, such as retitling the article. However, the Huffington Post gets a curation grade of “C” here because the manner in which they link is deceiving. It’s very difficult to discern where the link to the original article is in the text because the link color is nearly the same color as the article itself. There are only two ways for you to know where the link exists: (1) you make your nose touch the monitor and stare, or (2) you happen to hover your mouse over the link in which case the link gets underlined. Regardless, the Huffington Post is clearly trying to discourage visitors from going to the original source in a deceptive manner. Not cool. 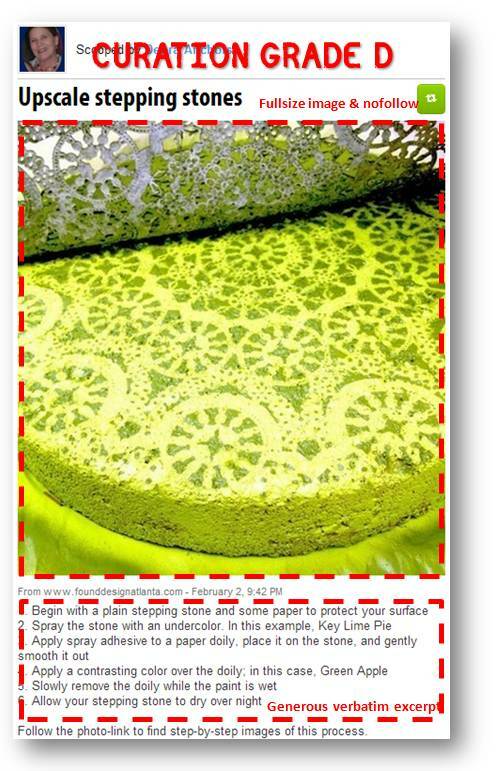 The next example comes from a page called Upcycled Garden Style curated using the Scoop.it platform. There are a few things done well here. Firstly, there are prominent links to the original source article if you click on on the title, or the image itself. Also, below the image they clearly display the site from where this content was curated. To the extent you are granted express permission or allowed to do so under applicable law, you must retain all trademark, copyright and other proprietary notices on downloaded and copied Materials, and any such downloads or copies are subject to the terms and conditions of these Terms. Though there are some best practices being followed here, overall, this example of curation gets a “D” when it comes to best practices. Adobe runs a great curated content site at CMO.com. You can read more about Adobe’s use case in Curata’s Content Curation Look Book. In this example, they clearly cite the original source (Mobile Marketer), only use a small excerpt, and have a strong call-to-action to drive traffic back to the original publisher. The next example is from the Content Marketing Institute. 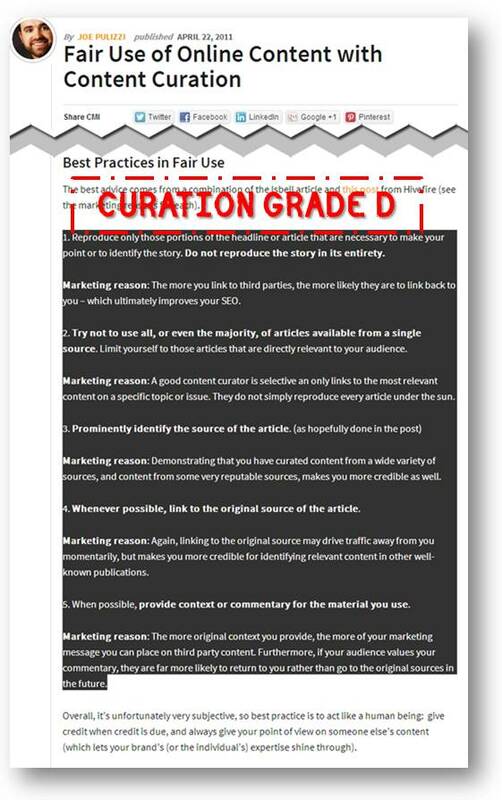 Following a webinar I did with Joe Pulizzi, he posted an article about fair use and content curation. While its intent is good (educating content marketers about ethical content curation), and it clearly cites me as the source of the content, the approach is lacking. 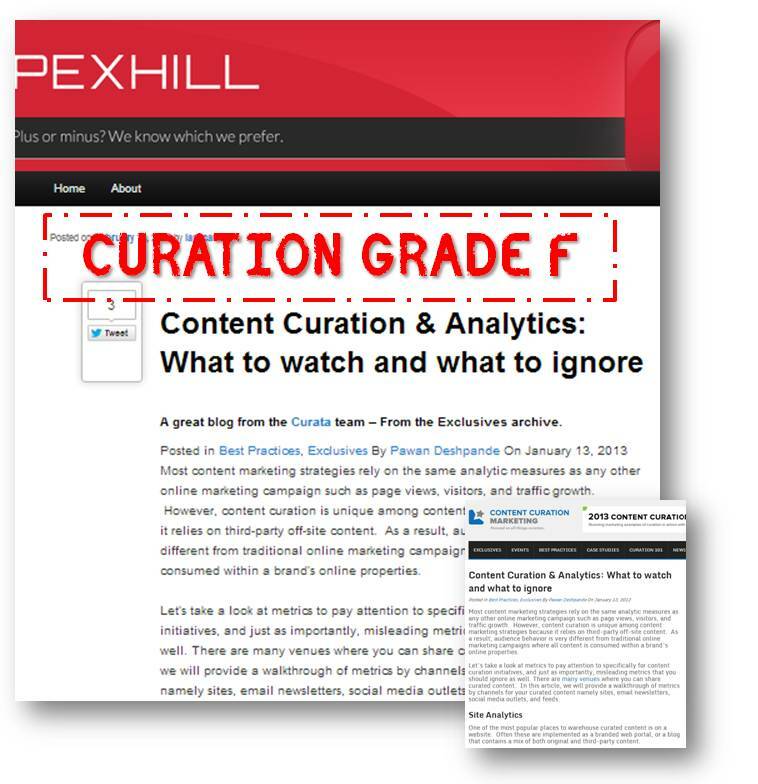 The next example is from PexHill, which found one of my posts on Content Curation & Analytics (shown inline in bottom right). In this case, they liked my content and decided to share it to their audience. They liked it so much in fact, they reposted the entire blog post on their site, including the original images. This gets a curation grade of “F” for outright scraping. We reached out to PexHill thanking them for appreciating our content, and asked that they include only a small excerpt, but they chose to remove the whole post instead. The last example is one from this very site of content curation done right. I came across an AllThingsD article about Yahoo’s rumored acquisition of Snip.it. For this article, I pulled out a short excerpt from the original article explaining the rationale behind the acquisition. Around it, I provided original commentary on the acquisition, with my prediction that Yahoo will kill the company post-acquisition. I also changed the title to something provocative reflecting my point of view. The source is clearly cited, and linked to without no-follows. Lastly, the image from the article is a thumbnail and not shared in full-size. I give myself an “A” here! If you cannot remember all the above best practices, there’s really one mantra to keep in mind that should guide you in the right direction: Create, curate, but never pirate. *Disclaimer: I am not a lawyer. This blog post should not be construed as legal advice by any means. Consult with a legal professional rather than reading a blog post if you are looking for legal advice. For comprehensive information on how to curate content ethically, download our eBook Content Marketing Done Right. Pawan Deshpande is the founder and CEO of Curata, a Boston-based company offering content marketing software used by thousands of marketers around the world. He spearheaded the first-ever panel at SxSW on Content Marketing in 2011, and was a 2014 Finalist for MarketingProfs B2B Marketer of the Year. Pawan was an engineer at Microsoft and Google where he was awarded patents in social networking and machine learning. He previously attended MIT where his graduate thesis won top departmental and international awards. Pawan is also a blogger for The Huffington Post, the Content Marketing Institute, CMO.com, Forbes, Marketing Profs, and other technology and marketing publications. See Pawan Deshpande's full bio. 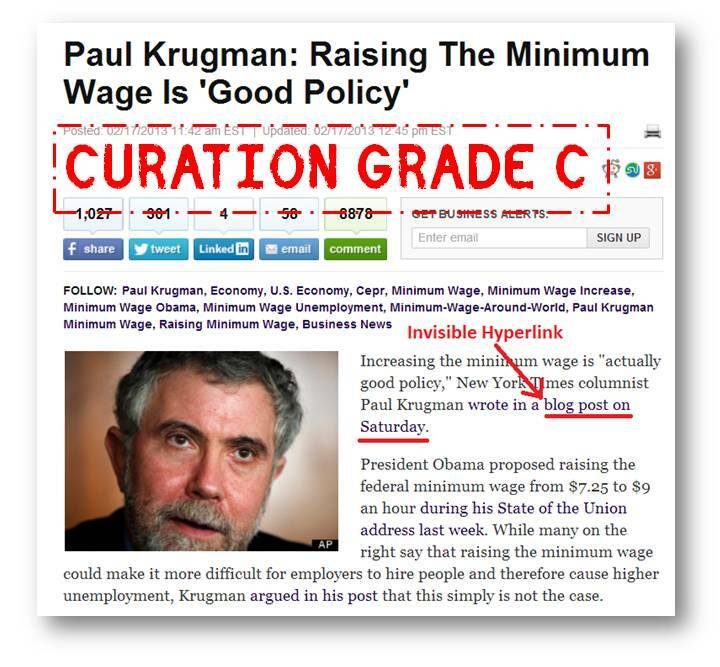 What an awesome article on best practices on curation! Thank you! 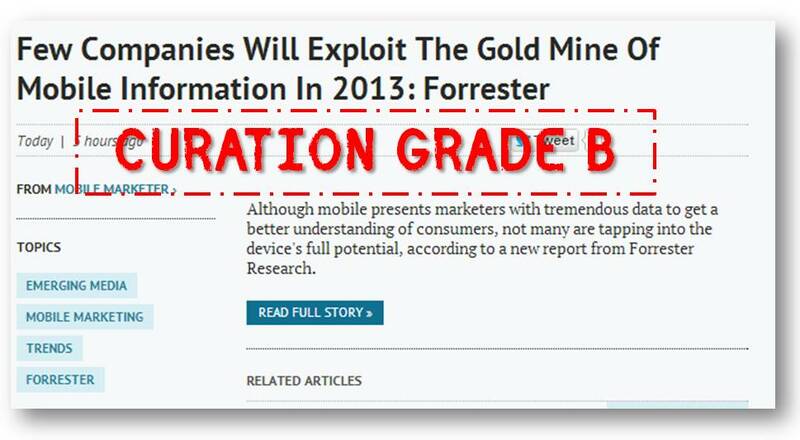 This article is chock full of useful information that every content marketer needs. It’s a must bookmark for every marketer. Really usefull information. Thank you! Very helpful. I was up all night doing research on this and then I came across this article. You clarified things very well and I bookmarked this to my computer. Wish I found it sooner lol. websites. However, I want to respect image copyrights. OK for use with accreditations. 2. I may be able to use thumbnails (per #6) but thumbnail sizing varies. What size should I target? Thanks so much. This is a big issue – and very little useful info written (outside of this). I would recommend TinEye for a reverse image search. For the the ideal size, I try to fit within a 100px x 100px bounding box, but that alone does not give you rights to use an image unless you are an image search engine (as per the ArribaSoft ruling). This Article seems so good and i find it very interesting when i read it . and also it is so very helpful to me as new in the content curation . When curating content do you need permission to use the source or is the curated content fine to use without permission if its done properly? Ok. Thank you so much. Your advice is greatly appreciated! Even if users upload images, they may still upload copyrighted images without consent. And because you would be hosting those images, you would may get into trouble. To avoid this, you can register as a Digital Millenium Copyright Act (DMCA) agent that lets you take down copyrighted user submitted content, and not have you get in trouble. If you read my ebook highlighted at the beginning of this blog post, I have a section on tools that you can use. One the of the tools I have highlighted is TinEye which can help you ascertain if an image is in the public domain, royalty-free, etc… Using this tool, you may be able better identify non-user uploaded images that you can repost. Again, I am not a lawyer by any means, so don’t take this as legal advice. 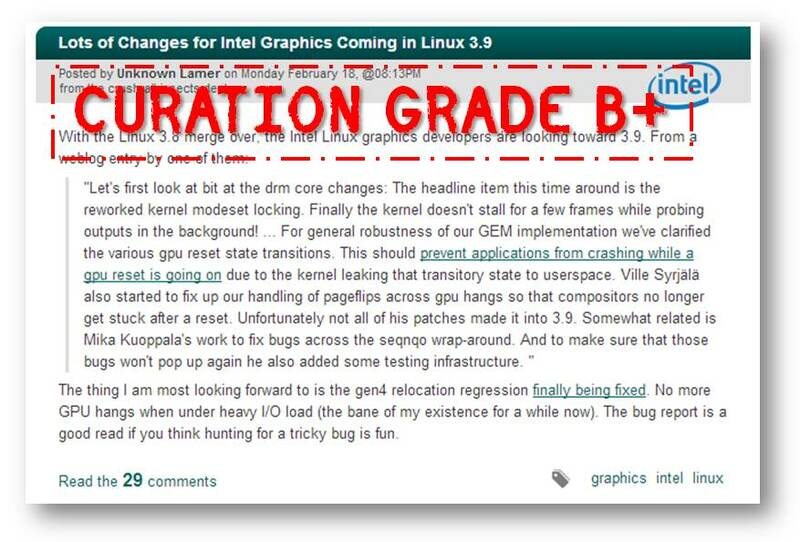 What grade would you give a site like http://www.viralnova.com? I think all of it’s content is repurposed and has rewritten headlines. thanks Pawan you just acted like a lord Krishna to me when I landed in a crisis. I run a non-profit organisation which as per its sports promotion initiative share and promote tennis news,views and related educational content on ITS WEBSITE We got a fair success with people all over india started following our website seeking for advices on tennis. The challenge now is for reproducing the content. So far we have been using the content from news website and linking back to their original source. However, we did not formally took permission. Now will like to get your expert opinion on how do we approach to content providers/producers (News websites, Tennis association etc) I have sent you an email with more details on your email id pawand@csail.mit.edu. Your support will be highly appreciated and will be credited to a noble cause. cannot produce direct traffic, and improve your site in search engines. I would recommend http://www.gocinchy.com. Awesome tool to curate the content for later use. bookmarked this to my computer. Wish I found it sooner lol. خدمة نقل العفش تحدث لمن يرغب ببقائه عفشه داخل مستودعات المؤسسة لمدة زمنية محددة، فالشركة لديها أفضل المستودعات التي تتمتع بمساحات شاسعة، وبارتفاعات عالية تتناسب مع أي قطع من الاثاث، وتجدر الإشارة أن هذه المستودعات مؤمنة كلياً مقابل أي مخاطر (إستيلاء على – حريق – حشرات – أتربة – أوساخ)، فالشركة تكفل سلامة الاثاث طول مرحلة تخزينه بمخازن المؤسسة.